Leven Rose Pomegranate Oil is pure, organic - your natural skin & hair antioxidant solution! Massage the oil into your clogged pores daily to loosen dirt, makeup and brighten your skin from blackheads. - - Apply Leven Rose Pomegranate Oil to your scalp where hair products, shampoo and conditioner can clog scalp pores as well. Pomegranate Oil has been known to help promote the growth of hair naturally. Wash hair after use as normal if it does not soak completely into your skin or hair. - - You'll notice when applying the oil to your skin or on your palms before applying to your scalp that a true unrefined Pomegranate Oil will still hold some of its natural oil. This quality lets you know that it has retained its essential nutrients. A couple of drops goes a long way but soaks into your skin quickly, leaving it smooth, hydrated and healthy-looking without a greasy feeling. Botanical Name: Punica granatum Extraction Method: Cold Pressed Country: Germany Description: The pomegranate is native in regions ranging from Iran through to the Himalayas in northern India. It was cultivated and naturalized over the Mediterranean region since ancient times. The pomegranate plant is a neat, rounded shrub or small tree that can grow to typically to 12 to 16 feet in height. Dwarf varieties are also known. It is usually deciduous, but in certain areas the leaves will persist on the tree. The trunk is covered by a red-brown bark, which later becomes gray. The branches are stiff, angular and often spiny. Pomegranate Carrier Oil is the result of the dried seeds, which are extracted and purified with supercritical carbon dioxide (liquid carbon dioxide) Pomegranate Seed Carrier Oil is suitable for applications in both soap and skin care. It is often viewed as a "face oil" in that it moisturizes and nourishes dry skin. It also balances pH and after application the skin usually feels soft and smooth. A luxurious and deeply penetrating oil from the cold pressed organic seeds of pomegranate fruit. 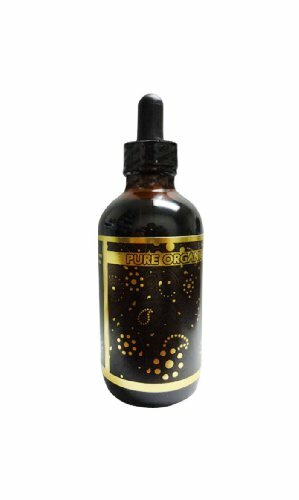 No heat or chemical solvents are used in this method, resulting in oil of the highest quality, nutritional value and potency. Made in small batches, the Pomegranate and their other fruit oils are fresh and a pleasure to use! 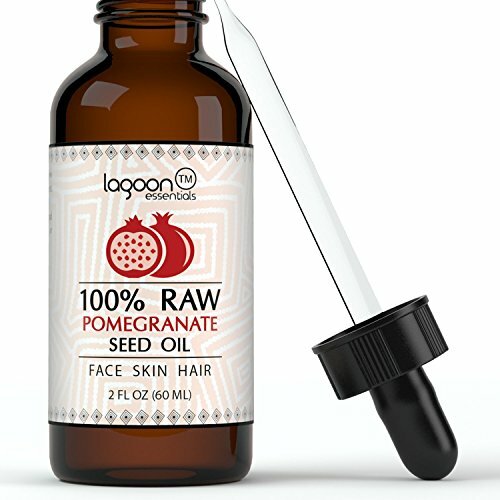 Pomegranate seed oil has a thick, viscous texture, and is rich in active ingredients that strengthen the epidermis, smooth wrinkles, and strengthen and stabilize the skin, while the antioxidants in the oil neutralize skin-damaging free radicals. Pomegranate seed oil is high in antioxidants, and thus has anti-aging properties, along with the other health benefits of antioxidants. Perhaps more importantly, pomegranate seed oil contains many fatty acids, of which over 80% is punicic acid Punicic acid (all called trichosanic acid) belongs to a group of fatty acids called conjugated linolenic acids, or ClnA for short. Rich in antioxidants, which deliver improvements in skin health and appearance by eliminating free radicals that can cause cellular degradation and premature aging. Contains essential fatty acids commonly used in cosmetic products to revitalise dull or mature skin, protect skin from the drying effects of wind and sun, help smooth wrinkles, reduce hyperpigmentation of scars and support a variety of skin conditions such as eczema and dermatitis. As a "dry" oil, it absorbs readily into skin without leaving any greasy residue. Weleda Pomegranate Regenerating Body Oil (90% organic) is an intensive, nourishing moisturizer that soaks deeply into skin to restore its vitality with essential fatty acids and antioxidants. Organic pomegranate seed oil helps promote skin renewal and protect against skin-damaging free radicals. 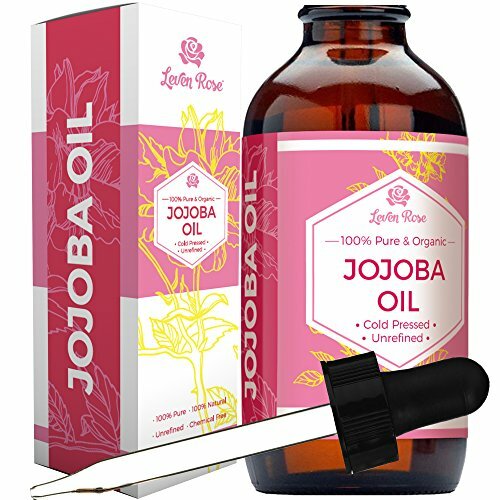 Organic jojoba seed oil preserves skin?s natural moisture, acting as an emollient to nurture skin and improve firmness. The sophisticated, all-natural fragrance of neroli and sandalwood pure essentials oils stirs the senses. Indulge your skin after a shower or bath with this fast-absorbing, certified-natural body moisturizer that locks in hydration and firms skin for timeless beauty. 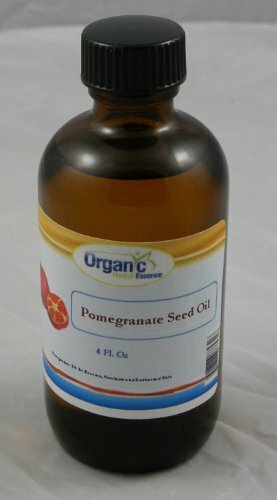 Product Name: Pomegranate Seed Oil - Organic - Cold Pressed (Unrefined) Botanical Name: Punica granatum Aromatic Description: Typical and Characteristic of Carrier Oils. 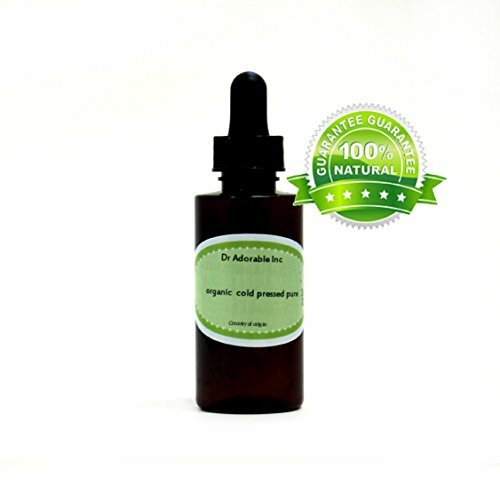 Pomegranate Seed Oil Cold Pressed (2oz / 60ml). 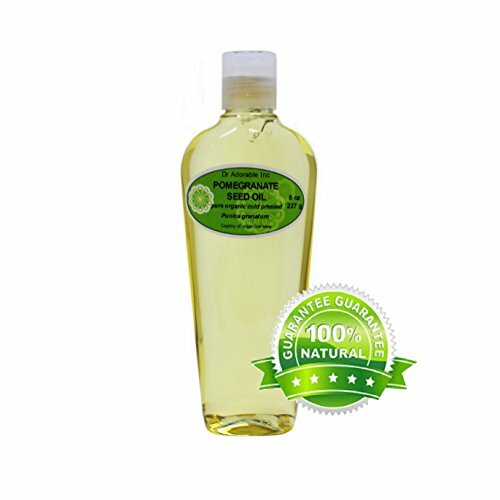 100% Raw Virgin Unrefined From Lagoon Essentials For Skin, Hair, Nails, Acne, Wrinkles, Psoriasis, Eczema... (Bottle With Dropper + FREE E-Book). Botanical Beauty Pomegranate Oil possesses a remarkable ability to nourich, moisturize and improve skin elasticity, improve skin tone and gives your skin a healthy glow. It also balances pH and after application the skin usually feels soft amd smooth. 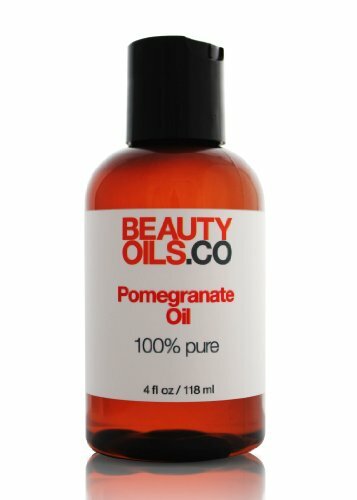 Botanical Beauty Pomegranate Oil is used on face, body, hair and nails. 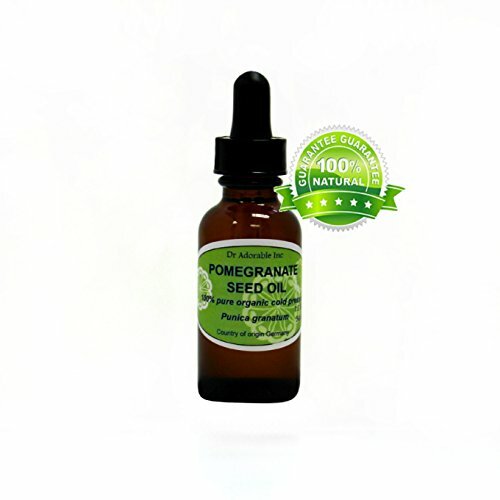 Botanical Beauty Pomegranate Oil is high in lipids including pucinic acid. It helps many skin conditions: dry skin, psoriasis, eczema, wrinkles and sunburned skin. Our 100% Pure Pomegranate Seed Oil is full of essential fatty acids and powerful antioxidants that help protect against free radical damage and promote the regeneration of skin cells. A symbol of prosperity and wealth in many cultures, this incredibly light, anti-inflammatory oil is ideal for aging skin. 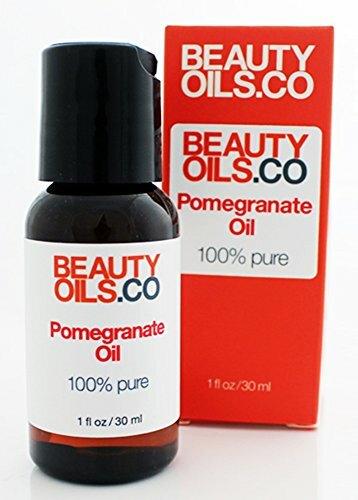 BEAUTYOILS.CO Pomegranate Seed Oil provides relief from minor skin irritations and inflammation, including dry skin, eczema, psoriasis and sunburned skin. BEAUTYOILS.CO 100% Pure Pomegranate Seed Oil is cold pressed to ensure optimal quality. For use on face and body. Comes with a convenient press-top cap dispenser. Ingredients: 100% Pomegranate Seed Oil (Punica Granatum). Botanical Name:Punica granatum Extraction Method: Cold Pressed Country: Germany Description: The pomegranate is native in regions ranging from Iran through to the Himalayas in northern India. It was cultivated and naturalized over the Mediterranean region since ancient times. The pomegranate plant is a neat, rounded shrub or small tree that can grow to typically to 12 to 16 feet in height. Dwarf varieties are also known. It is usually deciduous, but in certain areas the leaves will persist on the tree. The trunk is covered by a red-brown bark, which later becomes gray. The branches are stiff, angular and often spiny. Pomegranate Carrier Oil is the result of the dried seeds, which are extracted and purified with supercritical carbon dioxide (liquid carbon dioxide) Pomegranate Seed Carrier Oil is suitable for applications in both soap and skin care. It is often viewed as a "face oil" in that it moisturizes and nourishes dry skin. It also balances pH and after application the skin usually feels soft and smooth. 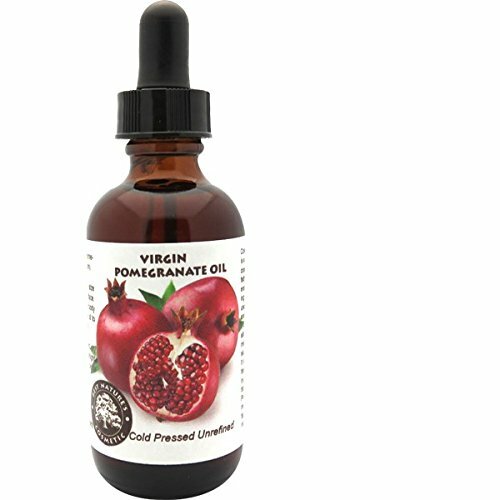 Cold pressed Pomegranate seed oil is a velvety and luxurious oil. It gently coats the skin, providing essential fatty acids to assist in skin cell regeneration. It greatly assists in combating age related skin issues and is used to revitalize dull or mature skin and promote a lustrous complexion. Our 100% Pure Cold Pressed Pomegranate Seed Oil is full of essential fatty acids and powerful antioxidants that help protect against free radical damage and promote the regeneration of skin cells. A symbol of prosperity and wealth in many cultures, this incredibly light, anti-inflammatory oil is ideal for aging skin. 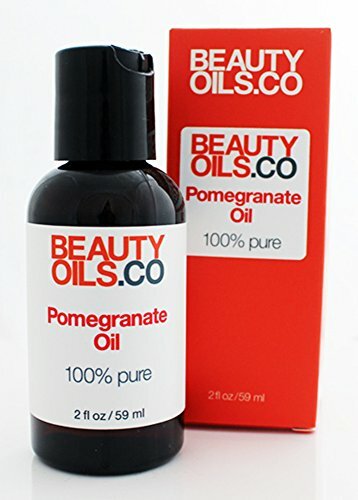 BEAUTYOILS.CO Pomegranate Seed Oil provides relief from minor skin irritations and inflammation, including dry skin, eczema, psoriasis and sunburned skin. BEAUTYOILS.CO 100% Pure Pomegranate Seed Oil is cold pressed to ensure optimal quality. For use on face and body. Comes with a convenient press-top cap dispenser. Ingredients: 100% Pomegranate Seed Oil (Punica Granatum). 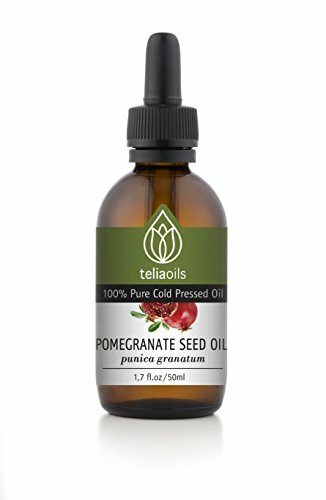 Cold pressed Pomegranate seed oil is derived from the seeds of pomegranate fruit which is extremely rich in rare essential fatty acids called Punicic acids(approximately 65%) and other fatty acids like Linolenic acids, Oleic acids, Palmitic acids and Stearic acids. Pomegranate seed oil is very nutritious and full of antioxidants so I consider this oil to be one of the best natural skin moisturizers. It fades Wrinkles and Fine lines, revitalizes mature skin, improves Skin Elasticity, improves Skin Tone and gives your skin a healthy glow. A little goes a long way, so just take 2 drops and massage your face every night before going to bed. Pomegranate Oil for Eczema, Psoriasis and Sunburned Skin Pomegranate Oil has amazing healing properties (it has ant-inflammatory, anti-microbial and revitalizing properties) and can do wonders for people suffering from Eczema, Psoriasis and Sun damaged skin. It provides quick relief from dry, itchy and irritated skin and repairs sun damaged skin too. 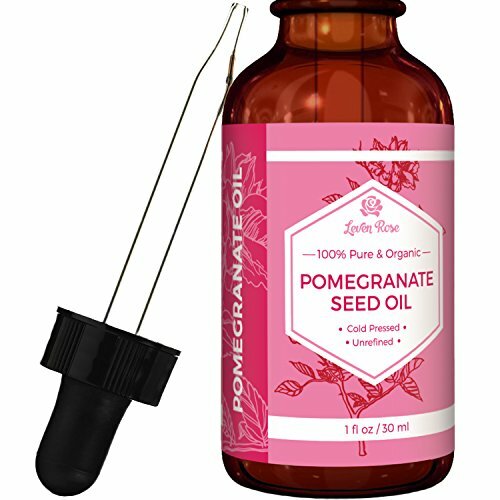 Pomegranate Seed Oil For Healthy Hair Pomegranate Seed oil is wonderful oil for hair because it revitalizes dull and dry hair and protects it from environmental pollutants and chemicals. Just mix a few drops of Pomegranate Oil with your regular hair oil and massage. You will love this oil. Pomegranate Seed Oil is extremely high in anti-oxidants, such as polyphenol, which can help neutralize free radicals in the skin and promote skin regeneration. Co2 Extraction of the Pomegranate seed leaves no chemical changes to the chemical profile. The result is an antioxidant rich, fatty oil, well known for its anti-aging and skin repairing benefits. Pomegranate Seed Oil is golden orange to Reddish-Brown in color, with an exotic fruity chocolate, sweet and sour aroma. After application it does not leave a sticky feel on the skin like conventional cold-pressed pomegranate seed oils. Pomegranate Seed Oil is used to nourish and moisturize the skin, improve elasticity, reduce wrinkles, prevent aging, and help sunburned and damaged skin. It is also very high in lipids, including Pucinic Acid, which can help reduce inflammation and swelling.